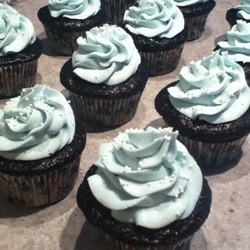 Chocolate cupcake with mint frosting drizzled with chocolate ganache and topped with mini chocolate chips! Carrot Cake cupcake (fresh shredded carrots, toasted walnuts, and raisins) with cinnamon frosting and topped with toasted walnuts! 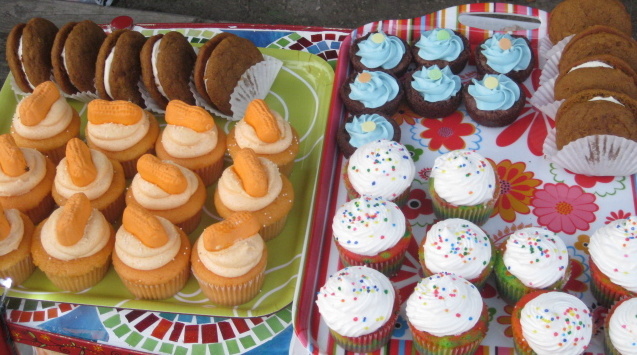 Birthday girl wanted lime green and ocean blue cupcakes! 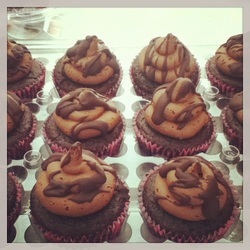 Chocolate Cupcake with chocolate frosting and topped with chocolate ganache drizzle and mini chocolate chips! 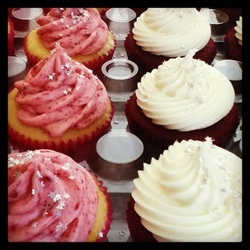 Red Velvet cupcake with vanilla frosting, topped with red sprinkles! 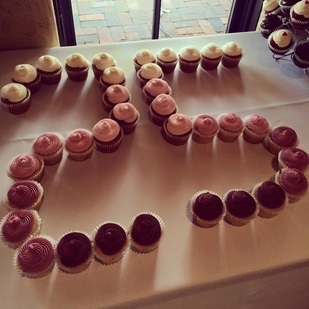 Various flavors for a 25th wedding anniversary celebration! Chocolate cupcake with buttercream, chocolate cupcake with strawberry frosting, "Hostess" cupcakes, and chocolate raspberry cupcakes. Lemon cake with raspberry curd filling and fresh lemon buttercream topped with a fresh raspberry. Chocolate cake spiced with cinnamon and chili powder, topped with Mexican chocolate frosting and drizzled with chocolate ganache and a sprinkle of chili powder! Peanut butter chocolate cupcake, topped with peanut butter buttercream, drizzled with chocolate ganache, with chopped up Reese's Cups! 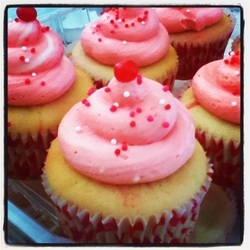 Lemon Cupcake w/ fresh Raspberry frosting topped with a lemon cookie and a fresh raspberry! Pumpkin cupcake topped with white chocolate cream cheese frosting, with crumbled pumpkin spiced streusel and drizzled with homemade caramel. Just like the real thing but vegan! Pink squiggle-o's especially for Valentine's Day! Dark chocolate cupcake filled with chocolate ganache and topped with fresh raspberry buttercream frosting and drizzled with more ganache and adorned with a fresh raspberry on top! 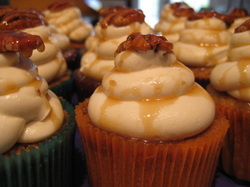 Bourbon Pecan Cupcake w/ Bourbon-Brown Sugar Buttercream drizzled with caramel and topped with a toasted pecan! Chocolate Cupcake w/ Vanilla Buttercream drizzled with caramel and toasted pecans. Vanilla Rainbow Cake w/ Fluffy Meringue Frosting topped with rainbow nonpareils. Devils Food Cupcake w/ Yellow Tinted Vanilla Buttercream Frosting and black sprinkles. * For a baseball team - The Pirates! 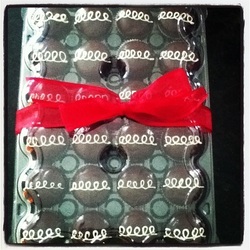 Dark Chocolate Cake, filled with marshmallow cream, topped with chocolate ganache, and white chocolate squiggle-do's! Chocolate Chip Pumpkin Cupcake w/ Cinnamon Cream Cheese Frosting and more mini chocolate chips! 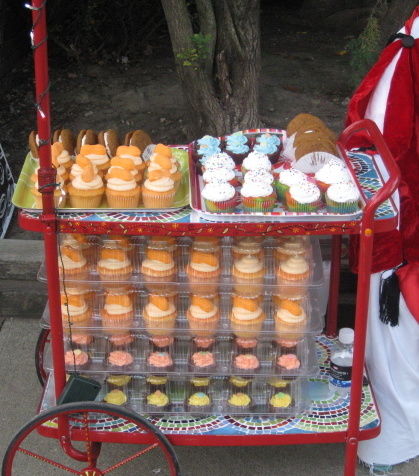 Vanilla Red and White Cupcake w/ Vanilla Buttercream topped with matching sprinkles! 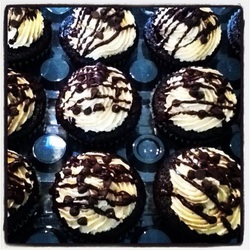 Chocolate Sour Cream Cupcake w/ Chocolate Frosting, filled with AND topped with chocolate ganache! 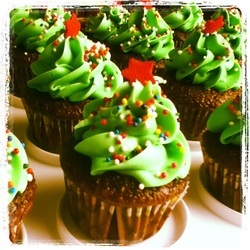 Chocolate Cupcake w/ Green Tinted Vanilla Buttercream - rainbow nonpareils and one large star sprinkle on top! 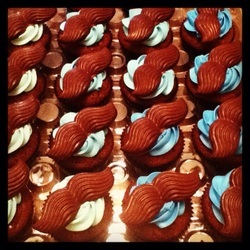 Devils Food Cupcake w/ Blue tinted Vanilla Buttercream Frosting topped with a solid chocolate mustache. 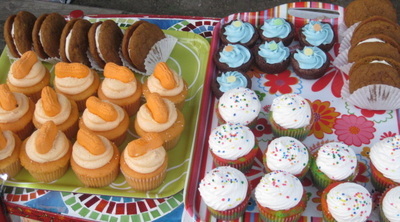 * For a baby shower welcoming a "Little Man"! Lemon Cupcake w/ Fresh Strawberry Frosting topped with silver star sprinkles. Red Velvet Cupcake w/ Cream Cheese Frosting topped with silver star sprinkles. 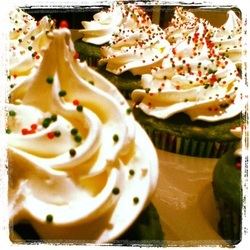 Green Vanilla Cupcake with Vanilla Buttercream and topped with red and green nonpareils! Chocolate Cupcake with Chocolate and Vanilla swirled Buttercream, topped with birthday sprinkles! Vanilla Cinnamon cake with vanilla buttercream topped with cinnamon and sugar! 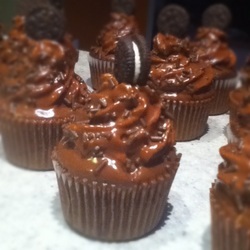 Chocolate Cupcake with chocolate buttercream, dipped in chocolate, and topped and chocolate sprinkles and a mini Oreo. Pink Lemonade Cake w/ Pink Tinted Lemonade Frosting topped with a fortune cookie dipped in pink vanilla chocolate w/ sprinkles! Vanilla and Oreo Cake with Oreo Vanilla Buttercream and topped with an Oreo dipped in white chocolate dusted with colored sugar and a star sprinkle! Chocolate and Oreo Cake with Oreo Vanilla Buttercream and topped with a half an Oreo! Peanut Butter Chocolate Cake w/ peanut butter chocolate ganache and topped with chopped Reese Cups! Cinnamon and Cayenne Pepper Cake with chocolate mouse frosting and topped with sugar, cocoa, and cinnamon! Multi-colored green Vanilla cake with green tinted vanilla buttercream and topped with clover sprinkles! A dark chocolate peppermint cupcake topped with peppermint buttercream frosting, drizzled with dark chocolate ganache, and sprinkled with crushed candy canes! Vanilla cupcakes with red hot candies baked inside, topped with pink tinted, cinnamon cream cheese frosting and sprinkled with Valentine's nonpareils and one red hot on top! Chocolate Mega-Sized Cake with Vanilla Buttercream and topped with birthday sprinkles! Red Velvet Cake with Cream Cheese Frosting and sprinkled with red sugar! Dark Peppermint Cake with Blue Tinted Peppermint Buttercream topped with white nonpareils. Dark Chocolate Oreo Cake with Dark Chocolate Frosting and topped with Oreo crumbs! Chocolate Cake with a thin layer of vanilla buttercream and topped with white nonpareils and hand-piped red icing. Vanilla Cupcakes with Swirled Purple and Green Tinted Vanilla Buttercream Frosting! 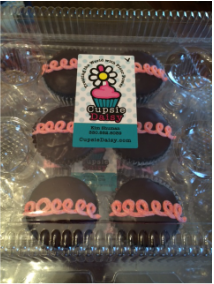 Chocolate Cupcake with peanut butter frosting, drizzled with chocolate ganache, and topped with mini Enjoy Life chocolate chips! 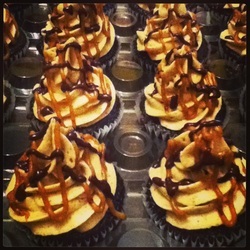 Chocolate Cupcake with caramel buttercream frosting, drizzled with caramel and chocolate ganache! 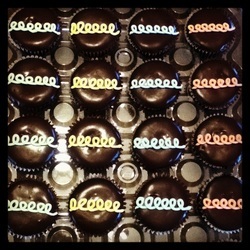 Dark Chocolate Cake, filled with vanilla cream, topped with chocolate ganache, and white frosting squiggle-do's! Lemon cake (using fresh Organic Lemons), with Raspberry frosting (using fresh Organic Raspberries), and topped with a lemon shortbread cookie and a fresh raspberry. 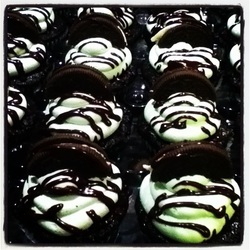 Chocolate Cupcake with crushed organic mint cookies and cream cookies, topped with mint buttercream frosting, drizzled with chocolate ganache, and a half a mint cookies and cream cookie on top! 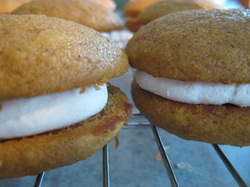 Pumpkin cake with cinnamon cream cheese filling! 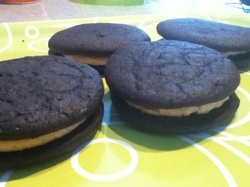 By far my most requested whoopie! 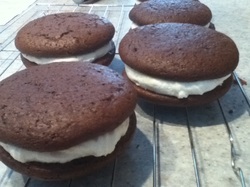 Dark chocolate cake with a marshmallow fluffy filling! 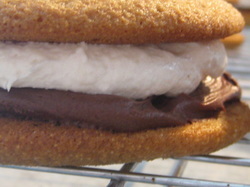 Graham cake with a layer of chocolate frosting and marshmallow fluff! Chocolate cake with a fluffy peanut butter filling! 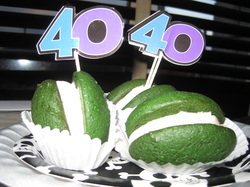 Green velvet cake with a "Bailey's Irish Cream" (non-alcoholic) cream filling. 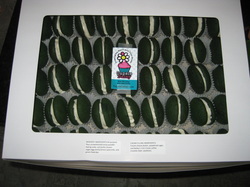 Green Velvet Whoopie Pie Custom Order! Pumpkin cookies with chocolate chips. Just like the "original" but with no dairy! 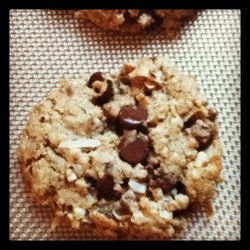 Dark chocolate cookie with white chocolate chips AND chocolate chips and roasted almonds! Chocolate chip oatmeal cookie with shredded coconut and toasted pecans, seasoned with a touch of cinnamon! 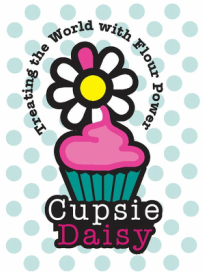 *Without a doubt - my favorite cookie! 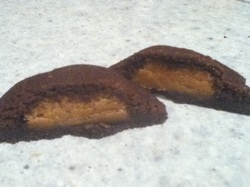 Basically a Reese Cup in cookie form! 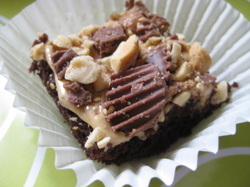 Chocolate brownie, with peanut butter frosting, and topped with chopped Reese Cups! Sugar cookie with tinted yellow royal icing. 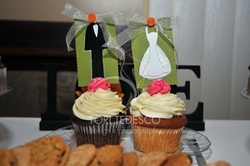 Oreo double-dipped in white chocolate with tinted pink chocolate detail. * For a Breast Cancer Fundraiser; one cookie per cello bag, tied with pink breast cancer ribbon. ﻿Chocolate covered double-stuffed Oreo's sprinkled with Valentine's Day sprinkles. A mix of Chocolate and Vanilla cakes with tinted vanilla buttercream and dark chocolate frosting!